"The windows, the bare walls. It was that every day. Every single day. They put me in a room on my own, I was in isolation," says Casey, 16. More than 200 pupils spent at least five straight days in isolation booths in schools in England last year, a BBC News investigation has learned. 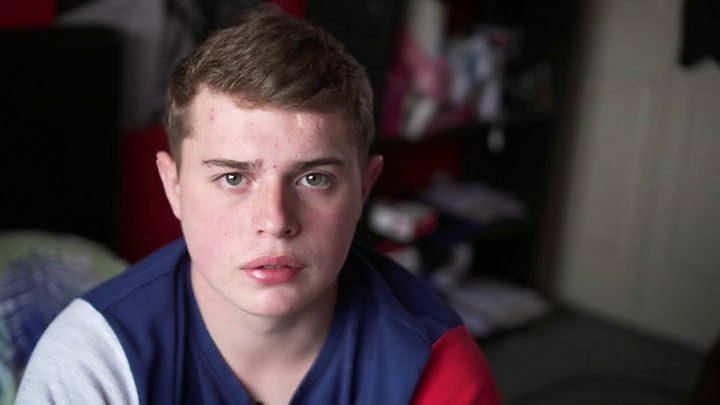 Casey's school disputes the length of time he spent on his own and said he was "regularly disruptive". The teenager says he was placed on his own after he contracted fibromyalgia. He takes the painkiller Tramadol for the chronic pain condition. More than 5,000 children with special educational needs also attended isolation rooms at some stage. Dozens of them had education, health and care plans (EHCPs) provided for children with complex needs. The Children's Commissioner for England, Anne Longfield, says school isolation can be "distressing and degrading" and she is concerned it is being used "as a gateway to excluding and off-rolling", where pupils are removed from a school's register. The Department for Education says children should be in isolation no longer than is necessary and that the health, safety and welfare of pupils must always be put first. Casey's father died when he was nine and he lives with his grandmother in Bristol. "I was quite athletic, I was happy, then I fell ill. That's when it all went downhill." He says he didn't learn during the isolation period and spent much of his time copying out of GCSE revision books, often without a teacher present. "It made me feel there was no point to learning," he said. Casey says the experience has had a lasting impact on him. "I locked myself into my room every day after I came home and shut the blinds," he said. "It felt like being isolated was normal. I wouldn't expect them to treat a dog like that. It was just vile." Casey's school says the room he was in was not the school's actual isolation facility. In a statement, it said that schools were increasingly encountering pupils "in crisis" who are being "failed by a combination of public services". Isolation rooms, or internal inclusion units, are facilities pupils are sent to when it is thought they need to be removed from a classroom during the school day. They vary in their nature significantly. Many include so-called isolation or consequence booths - partitioned desks in which children typically face the wall and work in silence. Occasionally schools use "seclusion" units - rooms where children sometimes remain on their own - while others place pupils in more conventional classrooms to work in silence. A recent government report on alternative provision said that schools with internal inclusion units saw them as a halfway point between excluding a pupil and keeping them in a mainstream classroom. How are isolation rooms being used? The BBC sent Freedom of Information requests to more than 1,000 secondary schools and academy chains across the UK asking how they use isolation and around 600 responded. It learned that more than 200 schools in England used isolation booths, with 12 in Wales and six in Scotland but none in Northern Ireland. While the majority had rules for children spending a maximum of one, two or three continuous days in isolation, 225 pupils in England and one in Wales spent a whole week in isolation booths as a single punishment last year. two schools - which included a bathroom as part of the facility - do not allow pupils to leave the unit all day. What rules are there for using them? Paul Dix says he has probably visited more isolation facilities than anyone else in his work as a behavioural consultant in schools across England. He says he has seen 50 children at one time in isolation in one school and children with Asperger's syndrome and ADHD in isolation rooms and met one child who said they had spent 36 days in isolation in one school year. "That is not education, it is a custodial sentence," he said. "Where's the regulation around it, where's the reporting, where is the accountability?" He said he has heard of pupils being placed into isolation for not bringing a pen or wearing the right shoes. Paul says disruptive pupils may need to be removed from classrooms but believes they should be returned after a short period and a discussion of their behaviour with an experienced teacher. "That is the intelligent way. Isolation is desperation," he said. Richard Sheriff is the executive head for eight schools - three of which have rooms with isolation booths - as well as president of the Association of School and College Leaders. He says his schools would never place pupils in isolation booths for five consecutive days, but understands why some schools feel the need to find ways of tackling extreme behaviour. "There is a gathering storm with regards to student behaviour," he says. "We've seen cuts in services in local authorities, but also in the ability of schools to purchase well-run, good quality alternative provision." He says a lot of society's problems are now being "laid at the door of schools". The government's school behaviour expert, Tom Bennett, says isolation rooms can be effective in tackling disruption in classrooms. "When you're a lone adult with a class of 25 pupils, it only take two people to really persistently wilfully misbehave for that lesson to be completely detonated," he said. He believes removing students from classrooms should be seen as a positive solution. "It can be a way of preventing fixed-term exclusions by keeping them in the school and being looked after," he said.